The Seattle Seahawks threw some serious haymakers at the Rams’ perfect record on Sunday, but each time Seattle made a big play, the Rams were able to counter. The Minnesota Vikings game, while never feeling as in doubt as the Seattle road win did, similarly resembled a Star Wars scene, with space crafts dumping laser beams on each other continuously until the final minute. 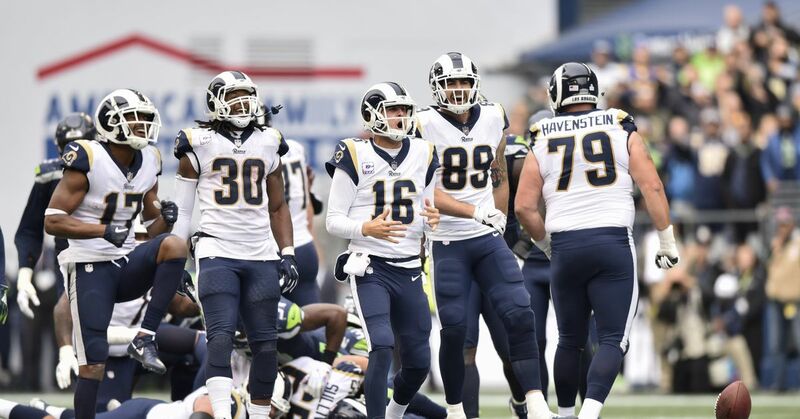 But with interesting weather conditions, increased pocket pressure, and concussions to receivers Cooper Kupp and Brandin Cooks; the machine kept slogging through a feisty Seattle defense. As long as Jared Goff, Todd Gurley, and Sean McVay are in the building there seems to be a belief that the Rams will outlast whatever an opposing offense can muster. And Goff’s office usually remains clean and safe behind a line that has somehow improved entering their second season together. On an individual level, most defensive players have performed adequately. Surely having Aqib Talib back would buy some time so that the pass rush could get home and contain quarterbacks more often, but technically backup corner Troy Hill played well in Talib’s place. Obviously, the defense was hurt by several Marcus Peters’ gambles in the Seahawks game, but it seems that the edge rushers, Samson Ebukam and Matt Longacre need to provide more containment on the pass rush moving forward. Ndamukong Suh and Aaron Donald are doing a good job of blasting the gut, but if quarterbacks are able to drift out of the pocket to buy themselves time, the job is left incomplete. Against the run the Rams defense has been solid at times this season. The Seahawks game was not one of those times. Seattle’s gruesome twosome of Chris Carson and Mike Davis had lanes all day against the Rams. It’s hard to be sure what Wade Phillips answer will be, but perhaps he will dial back some of the pass rush on occasion, and emphasize gap integrity that could provide more of a chance to read plays and stay home; similar to the way the Falcons played against the Rams in last year’s Wildcard game. And that is the last bit of advice this blogger will lend to a genius like Wade Phillips today. Let’s see what adjustments take place this week. Whether it’s the offense having barbecues together in their spare time, or going for it in 4th down situations where few other coaches would, McVay has put ownership of his team’s destiny in his player’s hands. What he really just did, was he allowed Jared Goff to take a major step toward becoming a respected team leader. It’s easy to forget that most of the players are in their mid-20s, and how easy it is to be a fool at that age. But McVay is a true teacher who takes the time to explain why and how things work to allow for a big-picture understanding. No matter what big personalities the Rams have brought in, this team seems about as professional as it gets.